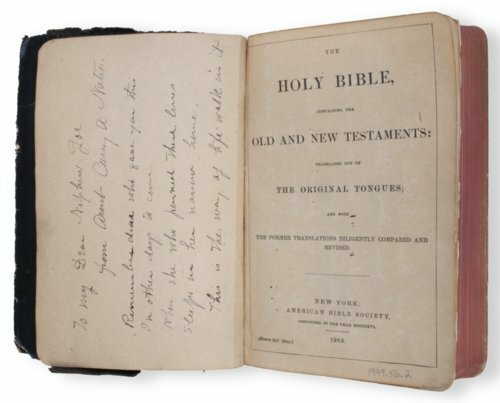 Inscribed black leather Bible once owned by Carry A. Nation, a devout Christian and nationally recognized temperance advocate. Nation gave this Bible to her nephew, Joseph Moore. Nation, a resident of Medicine Lodge, Kansas, was known to enter establishments that served alcohol illegally and attack the bar with a hatchet to discourage drinking. She was frequently jailed for vandalism. The Bible's inscription reads, "To my dear nephew Joe from Aunt Carry A. Nation. Remember dear who gave you this in other days to come. When she who penned there lives sleeps in her narrow home. This is the way of life, walk in it."